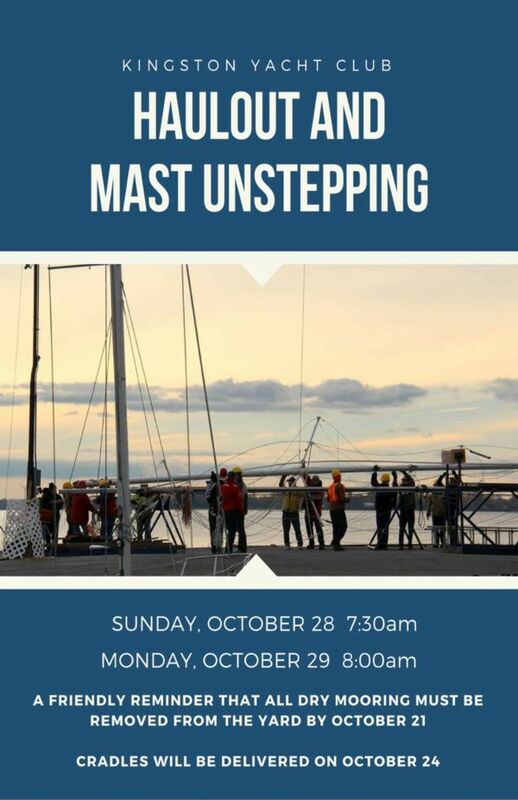 Haulout and Mast Unstepping is this Sunday and Monday. 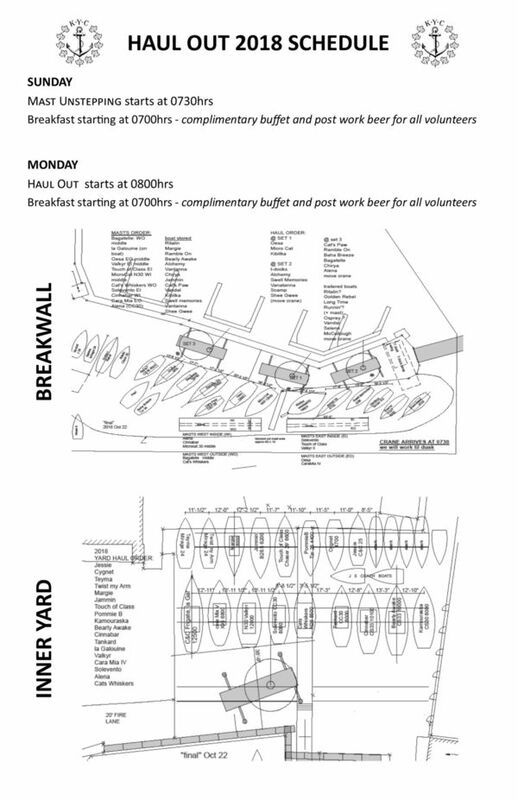 Please click here for the Schedule and Harbour Diagram. After Monday, when you’re down at our Club, you’ll notice that the fleet winter moored in the yard is set back further than usual. Rear Commodore Peter Cohrs has planned well. In November there will be five major construction projects. First, the damage to our breakwater and the sidewalk at its east end and south face will be repaired. Less chance of tripping among other things. Secondly, (you may remember the ice last winter) the area under and in front of our flagpole will be remedied with new rock. We don’t want the flagpole to fall into the harbour. Thirdly, and this is really important because the waves scour and damage it almost daily, there will be a new rock face placed from the flagpole to the ‘beach’. Fourth, a job we’ve been avoiding for well over a decade, we’ll replace the dock on the north wall of the north basin. It’s an area we’ve watched closely, not only because it’s needed mooring space but it’s a walking area and having the dock/wall collapse would only be bad. Fifth, and this will benefit our Junior Sailing programme, the Queen’s Sailing Team as well as open the possibility of new programmes, we’ll extend the north wall repair/improvement to include removal of the old marine railway and its base. In that space we’ll build a new launch ramp for dinghies. The kids launching there have been coping with ankle bending rocks and not been able to launch their boats. This part will include repair of the ‘bent’ finger dock that sticks out from the wall. We continue to improve and upgrade our Facility and in so doing, we’ll further protect the Members’ Investment and make our Club a better place for all. ~ haul some yard boats. Work til we can work no more…. please be at KYC and have your rigs and cradles ready to haul and place. 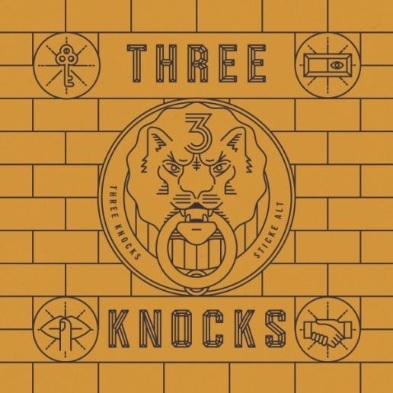 Three Knocks is a German-style ale with a decidedly robust and balanced blend of clean, bready malts, and an assertive hop backbone. 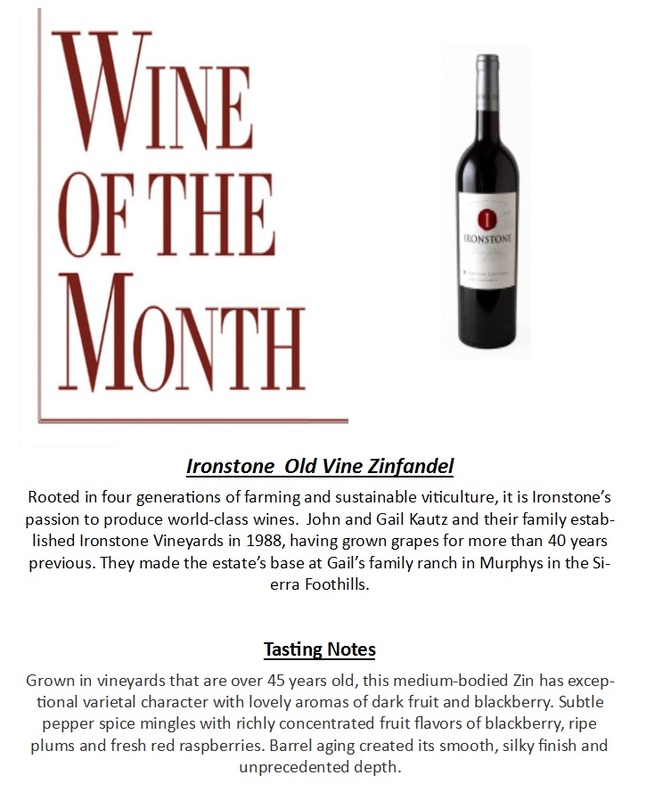 It is wood-aged on fire-roasted and vanilla French Oak staves. Knocks – welcome to the club! Beau’s Wild Oats Series beers cater to the adventurous beer drinker. Their bold flavours and strong character will challenge your expectations of what a great beer can be. Three Knocks is a stronger, bolder and oak-aged rendition of our award-winning altbier..
KYC is currently in negotiations to host the Blind Sailing World Championships next September in our Sharks. This would be an amazing accomplishment for us, bringing major recognition to our club and resulting in significant improvements to our club facilities & infrastructure. We will also be hosting the 505 North Americans regatta in late August. We can only accommodate a limited number of regattas per year and always such that there is clear benefits to our club. We are ever mindful of the impact on our members of hosting regattas, to whom we are truly grateful. 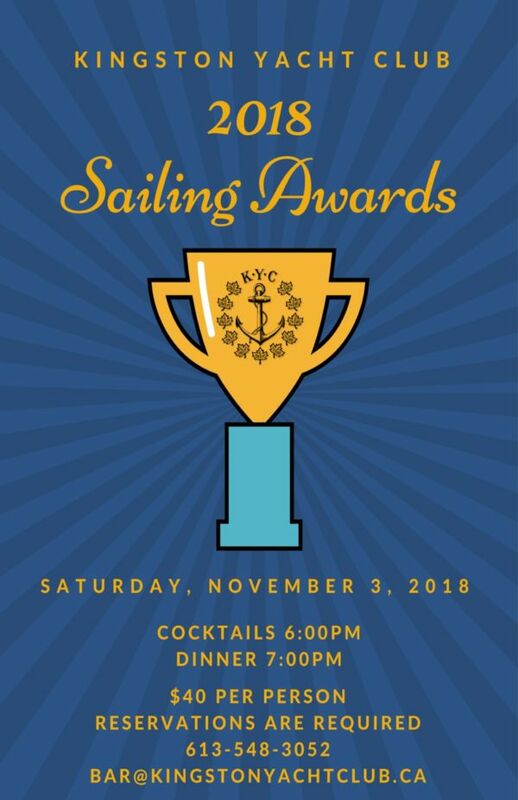 For the coming year, your Sailing Committee members are: Audrey Kobayashi, Bob Story, Brandon Tattersall, Chris Walmsley, John Curtis, John Lowther, John Vines, Ken Martin, Mary Wilson, Peter French, Peter Kraszewski, Paul Switzer, Rob Colwell, Robert Weguelin, Robin Wynn-Edwards, Ross Cameron, Ryan & Carolyn Heath, Steve Harrison and Mary Wilson. This past Sunday was the Annual Shark Kingston-Quinte Team Racing regatta. Every year this regatta is held on a rotating basis between mostly KYC and BQYC...Brockville too has hosted this event. This year BQYC was the host. The four KYC Boats who qualified to represent KYC were… Inevitable, Cariad, Shadfly and Jonathan Livingston Seagull. We packed up all our boats last week for the hour-long drive to Belleville. We arrived at 9:00 am at BQYC Member, Peter Aker’s boat house where he had us all launched and ready for the skippers meeting at 10:30 am. Our Kingston Team was welcomed by the commodore Steve Macklin and shortly after, the Principle Race Officer Don Reidel, performed the traditional coin toss where the team who won the toss could request which end of the line they would start from. Kingston won the toss and requested the Committee Boat was its preference to start from. All boats left the harbour after the meeting and headed to the start line were Don and his race committee crew did an awesome job getting us started on time and tweaking the course as needed throughout the day. BQYC won the first race and the second race came to a tie between the two teams. In a tied situation, the rule to win the race is not to be the first boat across the finish line, and this was the case for Kingston, so BQYC was up two races to none. Kingston now being under the gun, realizing that they needed to win the next three races to win the regatta decided to regroup and changed some of their strategies and tactics. Kingston Team never lost hope and hung tight to beat the reigning BQYC champs and bring the trophy back to Kingston. After all the boats were derigged and put back on their trailers, we all headed back to BQYC’s full size Alberg 22 bar, where we enjoyed good beer and wine, ate fantastic chilli , made by Peter Aker’s wife Sandra and enjoyed fresh baked bread and delicious deserts all provided by the members. Awards were presented shortly after eating. All and all, we had a great time traveling, sailing and racing and to top it all off, a great meal for the ride back to Kingston. Thanks to Peter Aker for making this regatta happen and to all the BQYC members for a wonderful regatta and congrats to our Kingston Team for winning the Regatta.